The one year anniversary of the Great March of Return is Saturday, March 30th, 2019. Earlier this month, the organizers of the Great March of Return issued a statement calling on millions of Palestinians to join the one year anniversary protests, which are grassroots, popular and peaceful. According to Al Jazeera, over 250 Palestinians have been killed while protesting in the Great March of Return since it began. The UN’s humanitarian body OCHA reported a total of 271 Palestinian fatalities and 29,187 injuries in the past year in Gaza, the majority during Great March of Return protests – tallying from March 30, 2018 – March 22, 2019. At least 41 of the fatalities were children. There are reports that Israel has linked the current ceasefire negotiations to the cancellation of the Great March of Return. A recent investigation by the UN Human Rights Council determined that Israel Intentionally Shot Children and Journalists in Gaza in 2018, and that the Israeli military may have committed crimes against humanity in its shoot-to-kill response to the Great March of Return mass protests. The report states there are, “reasonable grounds to believe that Israeli snipers shot at journalists, health workers, children and persons with disabilities, knowing they were clearly recognisable as such.” The report also criticizes the protest organizers for allowing some demonstrators to commit violence. Last week, the UN Human Rights Council condemned Israel’s “apparent intentional use of unlawful lethal and other excessive force” against civilian protesters in Gaza, and called for perpetrators of violations in the enclave to face justice. There are many ways you can take action in solidarity with the people of Palestine marching for their rights. The people of Gaza should not be punished with a vicious war for electoral gain. Israelis and Palestinians deserve freedom, security and the right to sleep in their homes at night without fear of falling bombs. Endless wars on Gaza and endless occupation will not achieve that for anyone. Sign here so we can deliver your voice to Congress and the media. The Boycott, Divestment and Sanctions movement is calling a two-way military embargo to pressure Israel to abide by international law. Learn more and join military embargo campaigns targeting Israeli military companies. Facing the Nakba, a project of Jewish Voice for Peace, offers educational resources to U.S. Jews and a general U.S. audience about the history of the Nakba and its present implications in Palestine/Israel. You can use it to share information your friends and family, and even lead a teach-in in synagogues or on college campuses using Facing the Nakba materials. Help change U.S. culture and shift foreign policy to support Palestinian rights. Join a local Jewish Voice for Peace chapter. View Jewish Voice for Peace’s resources commemorating 70 years of the Nakba. Print out posters and download shareables. 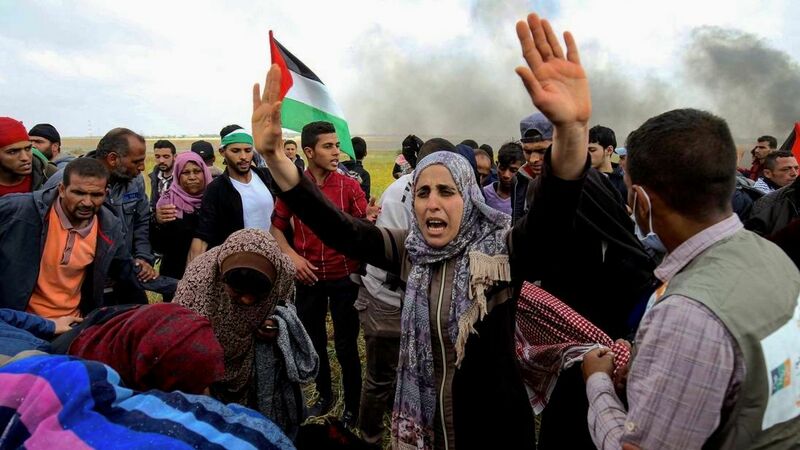 On March 30th, 2018 tens of thousands of Palestinians marched peacefully in Gaza in the Great March of Return, beginning a six-week tent city protest along the Gaza/Israel border from Land Day, March 30th, to Nakba Day, May 15th. Here’s what you need to know about the what happened in Gaza during the Great March of Return and how you can support Palestinian protesters. Nearly 2 million Palestinians, including 1.3 million refugees, live in Gaza. Israel and Egypt control Gaza’s borders by land, sea, and air. Israel’s siege has turned Gaza into what Noam Chomsky calls the world’s largest open-air prison. The vast majority of residents are unable to leave, including to the West Bank, due to sweeping Israeli and Egyptian restrictions on movement. Israel’s closure policy also heavily restricts the flow of goods, including building supplies and medical aid. One of the most densely populated places on Earth, the U.N. Relief and Works Agency (UNRWA) reports that Gaza will cease to be a “livable place” by 2020. Israel has a widely documented record of responding violently to peaceful protest. Well before the latest demonstrations in Gaza began, Amnesty International called on Israel to abstain from deadly violence, saying that the Israeli military has a “dark history” of killing Palestinian protesters with impunity. After the March 30th attack, the official Israeli army’s Twitter account claimed – then deleted – full responsibility for the #GreatReturnMarch Gaza shootings. The Israeli military evidently believes that any time Palestinians assert their basic rights, they should be met with deadly violence. The same belief exists in Israel’s ruling political class. Eli Hazan, the spokesperson of Israel’s Likud Party, claimed that all 30,000 Palestinian protesters are legitimate targets. This cycle of Israeli violence against peaceful Palestinian protesters is in grave violation of International Law. No one should be killed for taking part in a peaceful protest. Our horror at Israel’s planned killings only intensifies when media coverage frames the Israeli military and Palestinian civilians as equal powers. On the eve of the protests, mainstream U.S. news outlets repeated the phrases “Gaza clashes” and “border confrontations,” presenting both sides taking part in comparable violence. 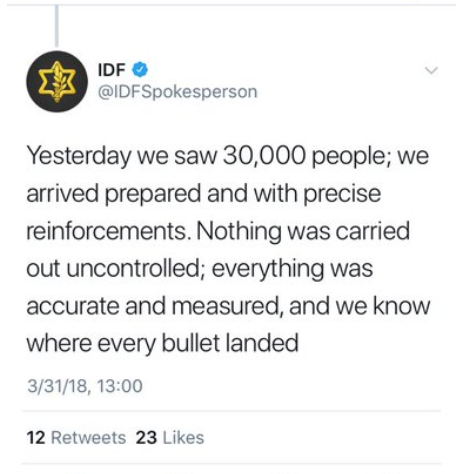 But the fact remains: on one side was a military that fired all of the bullets, and on the other side were civilians marching for basic human rights. It is misleading to call the Israeli military reaction to a peaceful protest a “clash” or “confrontation” as it was a violent response to a civil society march. On Brian Lehrer’s WNYC show, Cornel West said Martin Luther King Jr would have spoken out against Israel’s “massacre” in Gaza. Many other examples exist of activists and journalists providing accurate context and calling for principles of international law to be enforced. At Jewish Voice for Peace, we’ve put together resources to help amplify human rights in the media. The Israeli foreign ministry preemptively labeled the 30,000-person march in Gaza as a Hamas-sponsored event in an effort to excuse violent suppression of Palestinian protesters. But in the demonstration, the only visible flags were Palestinian, not factional. What’s more, Israel’s claim only distracts from the fact that they shot at thousands of civilians in a contained, occupied zone. "Hamas is a convenient excuse but one that isn’t actually necessary. Israel has never needed a justification to violently suppress Palestinian political activity — especially when masses take to the streets." The question many are asking is: why are Palestinians marching in the first place? May 15th, 1948 marked the end of the British Mandate (1922-1948) and the founding of the Israeli state. Palestinians consider this day to be al-Nakba, ‘the Catastrophe’, whereby they were dispossessed from their homes, lands, and livelihoods as a result of Israeli ethnic cleansing operations during the Arab-Israeli War between November 1947 and July 1949. In 2018, Palestinians commemorate 70 years of loss and dispossession while the Israeli state celebrates 70 years of independence. Palestinians face restrictions on freedom of movement, arbitrary military detention, torture, theft of water and land, ongoing settlement building, the blockade and siege of Gaza, and other severe violations of international law. The Great March of Return is about making good on the basic right of Palestinians, and all people, to live freely in their homelands. The only way forward is to recognize that there is a root cause: 70 years of Nakba. Rather than excuse the violence committed in our names, we have the opportunity to honor the yearning for homeland propelling today’s Land Day protests. To listen, learn, and plan our place in the world where all people have access to basic human rights. It’s a challenge to call out our Jewish institutions when they stand on the wrong side of history, to talk to our families when we have suffered personal attacks because of our religion, to speak out in our communities when we feel like the only voice. But it’s an opportunity too important to miss. There is no question that Israel’s actions divide the Jewish community and that increasing numbers of U.S. Jews are actively opposing Israeli policies. We are calling for an end to Israeli violence against civilians and a just solution for Palestinian refugees in Gaza based on principles established in international law. Yearning to be freed from imprisonment and for basic rights simply cannot be stopped by violent force – our own age-old stories, which we will recount every Passover, tell us so. The Great March of Return is an ongoing mobilization and we will be updating this page as the demonstrations in Gaza continue. Do you have a question or action to add to this resource? Send us your message here.